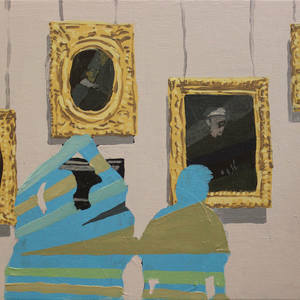 Phil Delisle is a painter and writer exploring various methods for representing artistic process. His works explore the conventions of framing; often having many paintings within paintings. Phil studied in the Bachelor of Arts program at the University of Waterloo and the Master of Fine Art program at the Nova Scotia College of Art and Design University. He was awarded the Joseph Plaskett Award in 2012 and was a finalist in the 14th Annual RBC Canadian Painting Competition.